﻿World Poetry Day: Calendar, History, Tweets, Facts, Quotes & Activities. World Poetry Day seeks to promote linguistic diversity and expression through poetry. The day also serves to encourage poetry, promote its teaching and support publishers involved in its dissemination. Poetry is a type of artistic expression that emphasizes feelings and ideas by using different styles and rhythms. The United Nations believes that poetry is an affirmation of our common humanity and proves that all humans everywhere share the same questions and feelings. World Poetry Day was proclaimed by UNESCO in 1999 in an effort to support creative expression and endangered languages. It is celebrated annually on March 21st. The oldest love poem in the world was written on a clay tablet during the Sumerian times, which was around 3500 BC. Despite having his work as a playwright praised most, William Shakespeare also wrote several poems that have been equally well received, studied and analyzed for centuries by academics and people alike. Poetry slam was started by poet Marc Smith in 1986 at a Chicago Jazz Club. It is typically scored on a scale of 1-10 by a panel of judges. Mahabharata is the longest poem in the world. The Indian epic poem contains about 1.8 million words. Read up about riddles, rhymes, limericks and sonnets and then try to write your very own original poem. Once written, share it on social media as a picture or a note. 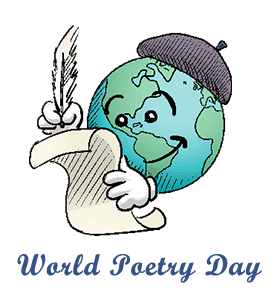 Spread awareness by using the hashtags #WorldPoetryDay, #PoetryDay and #WPD. Read a famous poem, such as: Dante’s Inferno, Phenomenal Woman or A Dream Within a Dream. Go see a poetry slam show. It is usually dramatic performances, reciting original poetry and is considered to be one of the most interesting ways of engaging poetry. Revisit your childhood by reading Dr. Seuss' books. Dr. Seuss was a famous poet and arguably the world's favorite children's author. Read Green Eggs and Ham , One Fish, Two Fish, Red Fish, Blue Fish and Oh, The Places You'll Go .